When I worked as a pharmaceutical sales rep, I learned quickly that everyone has his/her own style of selling. While I knew to follow company policies and practices, many times it was my individuality that got me past the gatekeeper and in front of the decision maker. And once I got there, I knew I must be on top of my game or my quick 30-second selling window would close as fast as it opened. My learning curve was quick as I wanted to be a top performer in the company. Everyone wanted to tell me the best way to sell the product and the information was overwhelming. After my first year, when I earned “Rookie Of The Year” status, I was asked to come up with a practical list that would help other first-year sales reps. 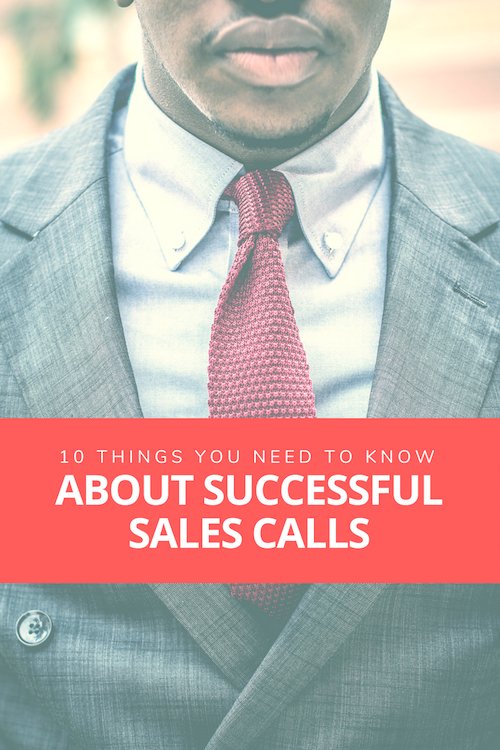 These 10 Tips for Successful Sales Calls is that list I came up with. 1. Do your own style. Resist the urge to do what every other successful sales person does. Every highly successful salesperson has their own style. And, what makes one rep successful may not match your style. Talk to several successful reps and take notes. Then, take some time alone to read over your notes and tweak them to adjust to you. Don’t get caught up in other people’s anxiety or their “you have to do this” messages. Take some time to process what works best for you. Then, develop your plan of action. Your prospects are bombarded with sales calls, emails, texts, etc. You are no more important than the next rep, however, your message is. Release the pressure of betting on yourself and place your bet on the product. Know your message. Give your presentation in quick nuggets. Support those nuggets with questions you can ask that will prompt a response that’s rooted in a problem your product can solve. 3. Know the 3 primary ways your product has a competitive edge over the competition. What makes your product the best? Always know what makes your product or service the best. You should always have at least 3 answers to the questions or objections causing a customer to decide if they should buy from you. This is not the time to speak negatively of your competitor, it is the time to promote the value of your product and why it’s better. This is especially helpful when you know that price is the only barrier for the potential customer. Knowing your product’s value and areas of a competitive edge will become paramount in whether your presentation will be heard and whether your product will be purchased. 4. They want to know more, but not that much more. Sales sheets, case studies, and marketing material of every kind are effective in pointing out the value of your product. But don’t over-educate your prospect or bombard them with too much information. Instead, lead with your 3 primary areas of competitive edge. If you don’t know what these are then you’re probably not ready to be talking with that prospect. 5. If they hear it, they also need to see it. You are only as important as what the prospect sees and hears from you. Your message sticks when you assist with a visual aid. I know it’s 2018, but never leave a prospect without leaving something behind for them to consider. And don’t forget: please be sure that your name and contact info are listed in several places on the material. Make it easy for the prospect to find you. 6. It’s up to you to get them listening. Even if you get a smile, direct eye contact, and a head nod, that doesn’t mean they’re listening to you. The only way to know if your prospect is actually listening to you versus being polite is to ask questions. Ask specific questions to know they are engaged. Involve them in the conversation instead of spouting off information and you’re more likely to peak their interest in your product. 7. You’re good, but you’re not that good. Thirty seconds after you leave a presentation, your prospect has probably forgotten most of what you said. Each sales call, give information, repeat the information, and then tell them what you just told them. Ask questions and engage them in conversation. Always ask them for the sale or at the very least some type of a commitment for the future. 8. You’re going to forget…so write it down. No matter what type of memory you may have, you will be bombarded with so much information that you will lose some detail as soon as you walk out of an office. Immediately jot down the important information such as the receptionist’s name, your prospect’s schedule, lunch policies, and policies regarding sales meetings or visits. Then, include questions that you asked and how the prospect answered. Finally, write down some questions that you need to address the next time and reasons why you feel confident they will or won’t buy from you. 9. Be the first and the last call. Sure, the early bird gets the worm. But often the last call of the day may be the last message your prospect remembers. Both can be great times. Learn when your prospect is most responsive. This will help them remember your message, pull the trigger, and eventually buy your product. 10. It is what it is so you better know your competition. Many times, you have zero authority to change the price of the product you are selling. So, the value your product adds and those primary areas you have a competitive edge are often times what convert a prospect to a customer. So you must know your competition. You should know their price points, their whole costs, their margin, products specs, and everything else you can get your hands on. Knowing this information in addition to what your prospect pays now is imperative for constructing a counter to any object but especially the “price is too high” objection. Every sales call is different and a rep must be prepared for objections, disinterest and rejection. Being told no once, twice or three times does not mean you should give up. There may be a yes on the fourth or fifth try. It’s a judgment call and one you must make when evaluating to return to a prospect’s office. If you have sold the value of your product, if you have answered all their questions and have provided as much information as possible without a sale, it may be time to move to another prospect. At least you’ve gained valuable practice along the way and are armed and ready for the next call.